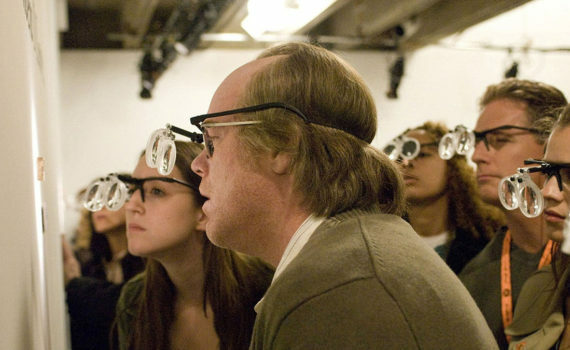 Charlie Kaufman is known for his writing (Being John Malkovich, Adaptation, Confessions of a Dangerous Mind, Eternal Sunshine of the Spotless Mind), but he also directed one and only one of his screenplays (not including the animated Anomalisa), and that of course is the darkly brilliant Synecdoche, New York. Darkness and brilliance are hallmarks of Kaufman’s writing, but they were also hallmarks of Hoffman’s acting, his talent gone from this world way too soon. The combination of the two for this film is something that we simply can’t take for granted, because it will never come again, and because this movie is an unparalleled, original idea that comes to life with tremendously painful acting in a way that leaves an impact that you just don’t see coming. Caden Cotard is a theatre director who knows that his life has absolutely no meaning. His young daughter is his only joy, his wife despises him, his talent is being wasted off-Broadway, and he’s pretty sure he’s dying in any number of painful, cancerous, unusual ways. After his wife leaves him and he falls for his box office manager and he receives a MacArthur genius grant, Caden begins his magnum opus; a city-sized art installation composed of actors who play out the ongoing events of the depressed director’s own life. Caden directs a man portraying Caden, his fears come to life before his very eyes, and the set morphs into a miniature world in which actors live & die, loves come & go, and nothing makes any more sense than real life does, because, after all, art is only a reflection. I may have, especially in my younger days, been impressed more by John Malkovich and Eternal Sunshine, because those films have deep messages to deliver, especially to teenagers who are forming their cinematic taste. But watching Synecdoche now, a little older and hopefully more mature, I was moved by the bizarre intensity of its story, and it could easily become my favorite Kaufman film were I to give it some more time to marinade, and perhaps if I was able to review his filmography with an unbiased eye. It’s so sad, so existential, so all-encompassing, that it’s hard to put into words the effect it can have on audiences. It’s a fictional dysfunctional life story, doubled down by the theatre that Cotard creates, giving us a glimpse of melancholy from two different angles, taking us down into the depths of despair that much quicker. There are so many tiny details you can’t possibly grasp them all the first time, and I can’t wait to go back and watch this one again, a film I’m sure has and will affect me greatly.